It was October 7th, in the year 2011, that the Occupy Wall Street movement hit San Diego. In a huge outpouring of demonstrators, up to 4,000 San Diegans marched through the Gaslamp District of downtown San Diego – mainly protesting for social and economic justice, against the state of the economy and the role of banks and Wall Street responsible for the financial downturn. Occupy San Diego was born in a giant – for San Diego – protest in solidarity with the rest of the country and particularly those in New York City – where the Occupy movement began. After the march ended up at City Hall – where speeches were given in the Civic Plaza, the protesters moved back to the original site, Children’s Park, for their first night of encampment. In terms of progressive political expressions, this was the largest demonstration in the City for many years – and there hasn’t been anything like it since. 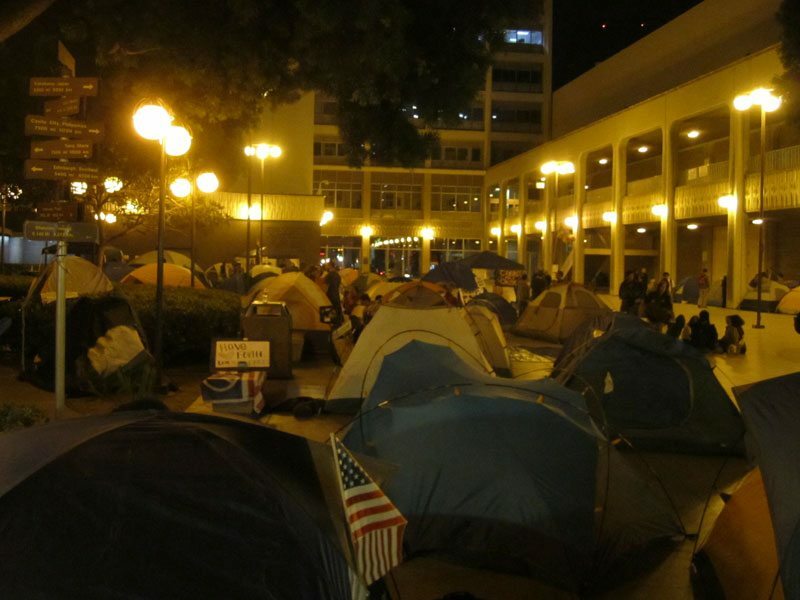 Later the next day, October 8th, Occupy San Diego returned to the Civic Plaza – which they renamed “Freedom Plaza” and made an encampment that would last for days and weeks. A hundred tents were counted at one point, along with a kitchen, first aid, media tents, and sign-making, a couple of libraries,the encampment was a bright spot in San Diego’s political history. Finally, under intense police pressure – now known to have been directed from Washington DC – as well as its own internal contradictions, Occupy San Diego fell apart – along with most movements across the nation – by or near the end of that year, 2011. There are remnants, and here in San Diego, the most on-going and spirited spin-off is WomenOccupy, a mainly singing group. An anniversary celebration of sorts happened on Oct. 7th at the Civic Center at 7pm. The event was also in solidarity with the demonstrations going on in Hong Kong. Even though it did fade, the Occupy Wall Street movement changed the nation’s discussion – for the first time, the expressions “the 99%”, “the 1%” entered our lexicon, and the discussion focused on the role of banks and the role of Wall Street like never before – or since. With all that had been put up during the occupation, something new and wonderfully addicting was being born. We were creating the beginnings of a new society right here in the shadow of City Hall, right here in the windy, cold corridors of San Diego power. As you walk among the nearly 90 tents set up in the Plaza, and observe what the occupiers are actually doing, you can sense that a small town, a small village, has been created right in the bowels of our large city, right in the heart of its civic government. A village born in the middle of a city. I looked around. People were in a food line, a constant figment of the occupation. The Food Tent was one of the first to be installed, and multiple tables were covered with boxes of food stuffs – lots of bread and rolls . Washing tubs stood nearby, along with bins for recyclables and trash. Stacked behind the tables were cases of water bottles and boxes of donated foods. Campers had been asked to bring their own plates, containers and utensils and most had. Twenty yards away was the medical tent, and it even had a cot inside. A sign hung outside that announced: “The People’s Clinic”. The Medical Committee appears to be very well organized and that there was always some volunteer hanging out in its tent waiting to be of service. From there, if you took a 90 degree turn to the west, you might run into the Voter Registration booth and tent, prominently set up so anyone walking by would see it. People were in their tents, talking, reading, eating – you know, the things that people do when they’re home. Small groups sat in circles, sharing food, stories and laughter. A few children were visible. Here and there, someone fingered their guitars. And you cannot escape seeing the overall amazing diversity of the encampment. All colors and varieties of human folk. Mingling with the humans were a number of very friendly dogs – all on leashes. I didn’t see any cats, however. I did pass the “Comfort” tent, where bins of donated clothing and blankets were being collected and displayed for the taking. Out of nowhere, two old friends appeared and strung up a Bulletin Board for the village. A hammock had been thrown up, hooked on sign poles, and someone had added a cardboard sign on the City pole with all the different destinations around the world that simply said “Occupy San Diego”. I walked some distance and around the corner was the Library, with a large display of books and reading material. Everyone had been asked initially to bring a book to share, and the occupiers and their supporters had certainly responded. There were also stacks of DVD’s to view, magazines, and other literature for perusal. No library cards needed here – the check out policy is very liberal. Up against one of the walls of the Quad was a string of tables under a tarp labeled “Media”. A live-stream camera was constantly on and a half dozen people sat behind their laptops. Legal observers and Safety Committee people mingle about. Tonight it was quiet. Mass movements without leadership and concrete goals are destined to fail. To think anything else requires an unrealistic understanding of the nature of capitalism and the role of the State under capitalism. The idea of the 99% vs the 1% is just a simplistic and fairly inaccurate class analysis. I agree with the comment by MaoTzu. People blame the campaign donation money, the two main political parties, the lobbyists, the PACs, the corporate interests, etc. And they are right: the bankers were just one of many special interest groups that created trouble with their lobbying efforts. But if you really trace the problem back to its source, those are not the root problem. America’s voters themselves are. Public discussion about campaign finance usually has the unspoken assumption that voters won’t consider a candidate who does not have tons of advertising and endorsements. That does not have to be true, especially because voters can use Google to easily learn about all the available candidates, and give them equal consideration. Granted, this requires people without Internet-connected devices to go find a way to access the Web. It also requires people to figure out what to type into the Google search box (something like “Presidential candidates”? ), and how to dig through the results. My opinion is that it’s reasonable to demand that effort of anyone who will bother to vote; people who can’t be bothered to look at the full range of choices should not vote. There’s a saying: “In every democracy, the people get the government they deserve”. We’re getting abused because we choose the wrong representatives. It’s our fault, and it’s our responsibility to change that. There’s also a saying in business: “Management is always to blame.” In a republic, the voters are the topmost level of management, because they choose the politicians. We don’t have to wait for anyone to fix the campaign finance system. We can consider candidates without special interests backing them. And we can refuse to vote for any candidate who accepts that kind of backing. That takes the power from the source of the money, bypassing the need for reform (and the lobbyists who would stop that reform because their jobs would be threatened). For me, the most frustrating aspect of this is how easily voters could defeat the legalized corruption of campaign finance, if voters acted collectively across party lines. Voters can look at less publicized candidates. Voters can reject immediately any candidate who takes any form of influence buying. Voters can support candidates who publicly warn that they will give no beneficial treatment to donors of PACs that independently advertise on their behalf. By doing those things, voters could render that influence money powerless. Most voters would not vote for a candidate who had been convicted of bribery while in public office. It wouldn’t matter how “electable” he/she is or what his/her policy positions are. So why vote for any candidate who accepts legal bribes in the form of special interest money? Because no special-interest-influence-free candidate wins at the conventions of either major party, my voting strategy requires choosing neither Democrats nor Republicans. Other parties’ candidates still appear on ballots. It does not matter which candidate, because that candidate will not win the election this time around. It’s OK to vote for a goofball or crackpot. I would rather vote for a random minor party candidate I don’t believe in than give consent to my abuse by voting for a bought candidate. If more people start protest-voting for those minor party weirdos you see on ballots, then sensible independent candidates will notice that and try running in various elections. We can vote for those people. As a nice bonus, this will pressure the two main political parties to adapt to voter preferences more than big campaign donors would like. That third party strategy has a risk of splitting the liberal vote between two candidates (as happened with Ralph Nader in 2000) or the conservative vote between two candidates (as happened with Ross Perot in 1992). The best outsider candidate would be a non-weird centrist who can steal votes equally from both parties; if that centrist belonged to a party, the party would have to refuse all special interest money. Lack of change results from almost everyone either not voting or voting for Democrat or Republican mainstream candidates. Why do we just jump back and forth, voting one or the other into office? By now it’s clear that that won’t change anything.